…and the fact that more and more Canadians are becoming “self-employed”… allow me to share this gem with you – courtesy of Non sequitur. There are some great observations out in the blogosphere about how some of the Harperite’s crazy cash (aka Economic Stimulus Funding) is being doled out. I wrote a note about this last week with regards to Clement’s refurbishing of public washrooms in Muskoka. One commenter to that post rightly pointed out that it is the habit of politicians to roll out the ol’ pork barrel when they have the opportunity. I agreed but noted that the ReformCons seem to do it more than the Grits did while in power. The Honourable Christian Paradis, Minister of Public Works and Government Services, today announced the awarding of $200,000 in repayable funding to Spa Le Montagnais under the Community Economic Diversification Initiative – Vitality to undertake the work necessary to establish a Nordic spa… The coexistence of a Nordic spa with other local attractions is bound to attract novelty-seeking visitors. 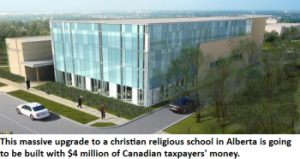 But giving 4 million smackeroos to a private christian school? Well that takes the cake and it strongly offensive for a hell-bound(1) atheist like me. I thought we were a secular nation… you know… all that separation of church and state and stuff. If so, why are Canadian taxpayers footing part of the bill for this project? IMO, this is clearly a case where the religious right is being thanked for its unwavering support for the Harperite socially conservative agenda. Thanks to Paulitics for pointing this out. Question – who goes to these schools? There does seem to be a lot of them. Especially out west. Anyhow, we’re gonna see a lot more of this crap, so I am already planning out the 3rd pork barrelling post, and the fourth and the fifth…. 1. As an atheist, I obviously don’t believe in the existence of a heaven or hell, or valhalla… or leprechauns either. But christians sure think I’m destined for fire and brimstone!